The Marc Jr Foundation would like to send a Huge, heartfelt thanks for celebrating #GivingTuesday with us. Because of you, DIPG families around the country will have access to grants and educational information to help them on this horrific journey! You have made a difference! Thank you once again for your donation. It means the world to us! #GivingTuesday, gobal giving day is Nov 27, 2018. Every year on Giving Tuesday, people come together on Facebook to support the causes they believe in by donating and fundraising for causes they care about. This year Facebook and Paypal are matching up to $7 million in donations on Facebook. 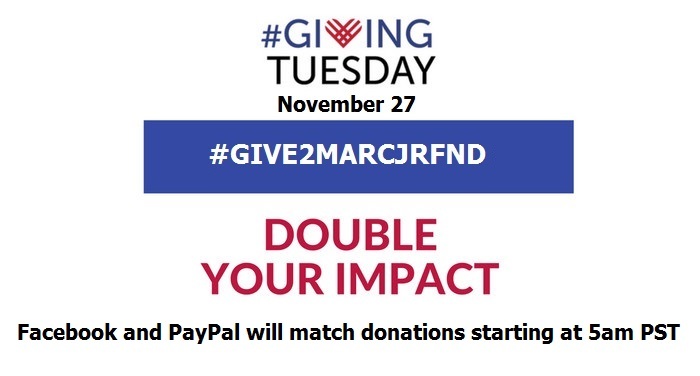 If you Donate to our Giving Tuesday #Give2MarcJrFnd campaign on Tuesday, November 27 itself, you can double your donation amount. Visit our Facebook page https://www.facebook.com/marcjrfnd on Tuesday, November 27, 2018, and Click the Donate button and the Facebook and Paypal will match the total amount you choose to give. We welcome you to donate at any time by clicking the Donate button below or by mail.